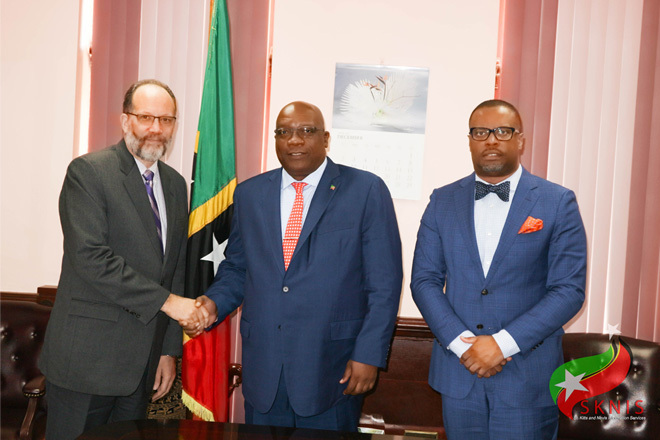 Pictured above are Prime Minister Dr. the Honourable Timothy Harris, who is the incoming Chairman of CARICOM; CARICOM's Secretary-General, Ambassador Irwin LaRocque (at left), and the Premier of Nevis and Minister of Foreign Affairs, the Honourable Mark Brantley. Prime Minister Dr. the Honourable Timothy Harris met today, Monday, December 17th, 2018, with the Secretary-General of the Caribbean Community (CARICOM), Ambassador Irwin LaRocque, in the Office of the Prime Minister at Government Headquarters. Prime Minister Harris said it was a special privilege to receive a visit from CARICOM’s Secretary-General. Chef de Cabinet in the Office of the Secretary-General, Mrs. Charmaine Atkinson-Jordan supported Ambassador LaRocque in the meeting. Also present at the meeting were the Premier of Nevis and Minister of Foreign Affairs, the Honourable Mark Brantley; Cabinet Secretary, Mrs. Josephine Huggins; Permanent Secretary in the Office of the Prime Minister, Mr. Andrew Skerritt; Permanent Secretary in the Ministry of Foreign Affairs, Ms. Kaye Bass; Director in the Office of the Prime Minister, Ms. Sherelle Hobson, and Senior Foreign Service Officer and Desk Officer for CARICOM Affairs in the Ministry of Foreign Affairs, Mr. Samuel Berridge. Today’s meeting served as the first briefing session ahead of CARICOM’s Thirtieth Inter-Sessional Meeting of the Conference of Heads of Government, which will be held in St. Kitts and Nevis from February 26th to 27th, 2019 under the Chairmanship of the Prime Minister of St. Kitts and Nevis. The venue of the Thirtieth Inter-Sessional Meeting will be the St. Kitts Marriott Resort. Next year, Prime Minister Harris will assume the Chairmanship of CARICOM from January 1st to June 30th, 2019. “The Chairman’s function as Head of CARICOM is very important, very significant, since you [will] act on behalf of the Heads in between sessions and the like,” Ambassador Irwin LaRocque said.